This digital video camcorder lens hood helps prevent lens flare and reduces sun glare by extending and shading the front lens element from exposure. Since the end of the lens is extended, you get the benefit of some extra protection from accidental impact. 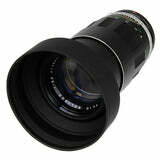 The hood screws directly onto the filter threads of the lens, and is held into placed by a secondary locking ring. The angles of these rectangular hoods match with the shooting angles of digital video cameras. 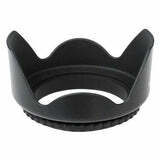 DV series lens hoods are also provided with an additional protective cap, which can be put on front of the hood.